In the year of Super Mario's 25th Anniversary Nintendo released Super Mario Galaxy 2, a terrific sequel, and the rather uninspired Super Mario All-Stars 25th Anniversary Edition. Not bad, but a continuation of the norm - an accomplished (almost perfect) slice of platforming heaven and another release designed for little more than fuelling nostalgia. Now, with the 30th Anniversary upon us, Nintendo has stepped out of its comfort zone with the brilliant Super Mario Maker; 2D Mario platforming will never be the same again. Nintendo has, on various occasions, given us creative freedom in sub-franchises, ranging from Pullblox to the Mario vs. Donkey Kong series and beyond. What it hasn't truly done, beyond some spin-offs and experiments, is hand over the keys to one of its blockbuster IPs; yet in the current gaming age that's exactly what's required. Gamers still want to be entertained, yes, but there's also a hunger for freedom and creativity. Super Mario Maker applies structure and sensible limitations, but it also gives Wii U owners the flexibility to do wacky things that not even the series developers have done up to now. This is more than it appears from a brief glance. Let's go back to the beginning. When booting up the game its charm is immediately striking - it's about as 'Nintendo' as it gets, with cute and clear design and little touches that most developers would easily overlook. Whether it's the gawky Coursebot, the yapping dog used to undo changes, the silly countdown when wiping a course for a fresh start or just the fact you can 'play' the opening screen, this goes out of its way to make you smile. It works, too. From the off you have two core options, Create and Play. Create is the star attraction, and from the off you're given a sample course to clear that introduces you to the first batch of unlockable tools and items. This pattern is repeated with subsequent timed unlocks; once tools are unlocked you simply spend 5 minutes experimenting with them to trigger the next set of items, stage types and features that are 'delivered' a day later. While brilliant for those eager to master tools gradually or for younger gamers, we were hoping for an option to skip this slow unlock and have everything available right away; that doesn't exist, but you can mess around with your system clock if you want to trick it into unlocking everything (then you can simply put it back). In any case, the gradual unlock makes sense in helping you get the most out of the creation tool. An early lesson is to not over-use items just as they're available; some of the most enjoyable creations we've played have used a small number of items in innovative ways. The general interface has been carefully constructed, exclusively using the GamePad and in the process serving as the best advert yet for the controller - the majority of activities are completed with taps and drags on the touch screen, but some neat shortcuts for copying and pasting, for example, utilise shoulder buttons. You can use other controllers for playing levels, of course, but creation requires the GamePad. Also, to appease semi-outraged individuals adamant that they don't want a specific perfectly manicured woman's hand representing them on the TV screen, this can be changed to various skin tones, cat paws and even a gloved Mario hand. That's one silly controversy that was particularly mis-informed. The touch interface itself is certainly intuitive, but the gradual unlocks help ensure it's not overwhelming. By the end you can seamlessly switch between four game templates and six level environments, while there are 60 different in-game items and tools in rows that you alternate between; you can also setup a custom row to display at the top of the screen when you're creating. This is a simple but important feature, as it supports those that have planned ahead and have a strategy in mind. Scanning five rows of 12 to find the invisible block option can be bothersome, so having your own shortcut set is a minor but useful addition. What makes the included items exciting is how they support creativity beyond conventional Mario design - you want swimming Goombas or to have the little villains fly a Clown Vehicle while wearing a Kuribo shoe? No problem. As Nintendo's demonstrated and can be easily recreated, you can do silly things like have Mario wear a shell as a helmet, and experimentation really can lead to unique moments. It's striking, when considering this, how Nintendo has not only provided tools for us to make our own Mario levels, but added enough strange ideas and freedom that we can take the classic gameplay in new directions. Some other features worth noting to highlight the freedoms on offer relate to level scrolling and time limits; you can produce your own scrolling levels at three speeds to push players along or limit the time they have. That opens the scope for 10-second levels and rapid airship stages that can test the player's abilities to the max. Then there are sound effects, with some goofy pre-made examples to be deployed as you see fit or the option to record your own sounds using the GamePad mic. These are triggered by the player once they leap through a specific grid, and again add to the freedom available. Another fun addition is the use of amiibo, with plenty of the expansive range supported here. The new Anniversary Mario amiibo figures will support super-sized characters, while existing figures from the Smash Bros. or Mario Party range are largely supported. 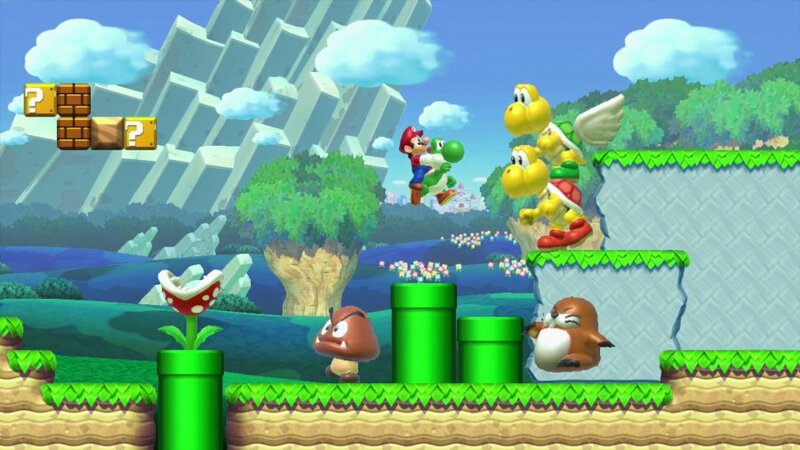 Scanning a toy brings the icon onto the screen and you can place them in blocks to be accessed via an in-game mushroom, functioning as super mushrooms in adding a hit to the character. It's amazing how many of these figures are supported - two of our favourites that we're allowed to mention are Bowser and Donkey Kong - though they are limited to the Super Mario Bros. 8-bit template. That's a pity, but the fun animations and the fact they control the same way as Mario does make them a quirky addition to experiment with and share. It's a testament to the grid-based templates - a virtual recreation of the original paper-based design approaches of the NES era - that extravagant stage creations ultimately need only time and creativity. The workable area can be expanded to be rather large, with decent space for verticality, and you can even have a designated sub-zone which can be jumped in and out of utilising warp pipes. It doesn't feel difficult to create a complicated ghost house labyrinth, for example, you just need to find a quiet space and free up your schedule. A sign of brilliant design is for complexity to feel simplistic - Super Mario Maker achieves that. You can save a work in progress, naturally, and uploading is easy to accomplish. You start off limited to 10 uploads at a time, with more to come once you earn Star ratings from other players; the process is simple and very quick, with the only requirement being that you must complete the course yourself prior to uploading. Every time you load the game, too, you can have notifications pop up to let you know when someone's played your course, keeping a track of Star ratings and comments. On the review servers the whole process was particularly rapid, and even accounting for it potentially being a tad slower when the servers are busier, it's well set up. So, if creation isn't for you or you fancy a change, let's weigh up the Play options. For starters there's 10 Mario Challenge, in which you have 10 lives to clear eight pre-loaded stages - these levels are enjoyable and also showcase various features and may give some design ideas. Beating a course adds them as Sample options in the Coursebot menu to play at any time, while clearing every level leads to some fun unlocks. For quick dip-in sessions, reliably (and professional) well-designed stages and some classic Mario platforming with a twist, this is a solid option. Course World, meanwhile, is the hub for accessing courses created by others, which is where potentially endless replayability comes in. 100 Mario Challenge pits you up against user created stages in three difficulty settings, which is a nice way to blitz through stages, rewarding them with stars if you please. Naturally 'Expert' is packed with troll-tastic - though evidently beatable - stages, but this mode is a neat way to unlock goodies and get a quick gaming fix. 'Courses' is where many may find themselves, with 'Featured', 'Star Ranking' and 'Up & Coming' categories all designed to help you find popular or fresh stages. The interface itself is pleasing, with a level's entry including a graphic that shows a zoomed-out perspective, with shortcuts to view Miiverse posts, play or download the stage. Downloading adds it to your collection and you can even edit the levels yourself (though a symbol shows it's not an original creation of yours), while playing the level allows you to give those aforementioned Stars should you decide to, or to view the user's profile and Follow them. A niggle we have with this mode is the potential for discoverability, especially once an audience of - potentially - millions is active. Search options allow you to target specific difficulties, regions or upload time periods, while you can also find specific stages by inputting a 16-digit code. If Nintendo's planning to evolve and improve this in the future it should consider additional search filters, such as finding levels using a specific game template, environment or set of items. As it stands, and even with the Up & Coming category, our fear is that the sheer volume of levels will make it tough for some to even have their levels played. We'll see how that evolves, but the cream does eventually rise to the top. The 'Makers' area also broadens options. Here you can view those users with the most Stars to their name, or alternatively those that you're Following. As the interface moves so quickly it takes no time to check out the latest courses of your favourite creators, with all of the options to play, download and rate levels as you'd expect. Your own Profile page is also important in keeping track of content, in terms of looking over courses you've played and checking progress of your own creations. When you combine Create and Play together there's a staggering amount of content on offer. What's particularly clever about Super Mario Maker, from Nintendo's perspective, is that it offers something new while not eradicating the appeal of future 'traditional' 2D Mario titles. 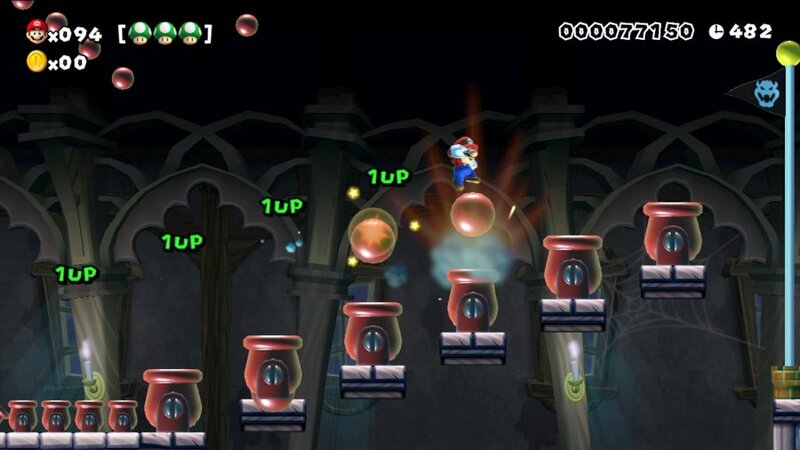 Going back to play any of the four original games on which the templates are based provides a reminder of the tight design and stage-craft that Nintendo has, not to mention the dynamic camera work at play in New Super Mario Bros. U, for example. Those are polished, tight experiences that are still valuable parts of the Nintendo landscape. 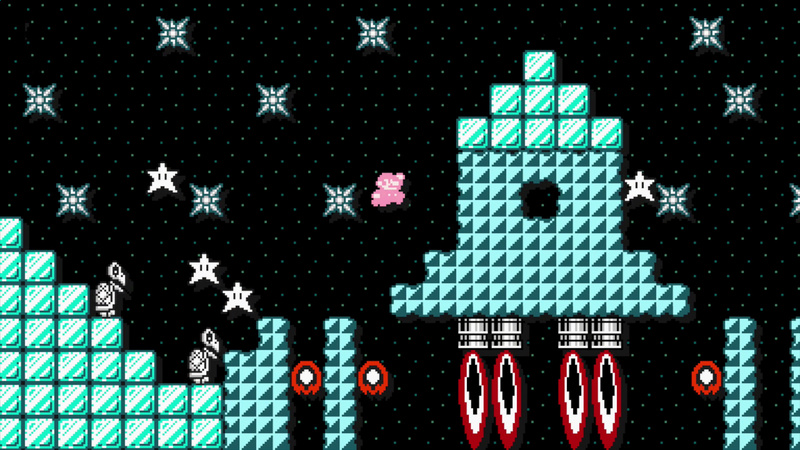 What Super Mario Maker delivers is entirely different. With freedom and the playful options provided by Nintendo comes reckless, unconventional and goofy gaming. Many of the stages we've enjoyed would feel wrong in a normal Mario platformer, but in the context of this experience are hugely fun. If 2D Mario games are the fine art galleries, Super Mario Maker is a public 'happening' of chaotic street art, in which anyone and everyone simply goes with their instincts with spray-paint in their hand. One doesn't supercede or replace the other, it merely enhances possibilities. So when we say that Mario platforming won't be the same again, we're not saying the time of normal 2D Mario releases is over. What Super Mario Maker does is provide a new divergent path, running perpendicular to the classic gameplay that tops the charts generation after generation. Nintendo's embraced this, in providing a toolset and means of sharing creations that's both substantial and playful, maintaining templates while experimenting with them. Super Mario Maker isn't quite perfect - no game is - and has areas that could quite easily be improved in updates. These mostly relate to the aforementioned discoverability and improved search options when browsing creations from around the world. With some additions on this score - and possibly a YouTube upload option to take sharing to the next level - then this title can truly deliver to its full potential. Even with that said, though, what we have here is something truly special. Super Mario Maker is so much more than a simple level creation tool, as Nintendo has clearly invested great time, resources and thought into making it greater than its core concept. The user interface, the creativity of the tools that feed the player's imagination and the overall polish are a testament to the development team's efforts. Whether creating, exploring or just playing, Super Mario Maker provides an exceptional experience. If you've ever enjoyed a 2D Mario game and have a creative, playful spirit, then you should have already decided to buy this. It has plenty of tough competition, but this is the definitive Wii U game. Definitive WiiU game, eh? Sold. And yet it's just more 2d Mario. I'll pass! Waiting for Team Magma's 8/10 for the inclusion of water levels. It says a lot about both this game and the Wii U, how this game is the best to release on the platform yet. Yeah, that controversy thing with the hands must've got outta hand. @Spoony_Tech Heh, Even though this will (probably) be the last 2d Mario game you'll ever need? So, this game's existence begs an interesting question: are 2D Mario installments now rendered pointless going forward? I mean it's not like Miyamoto is back there anymore churning out each level's design in those games. Why buy New Super Mario Bros NX when Mario Maker now is a thing? Wow. IGN Spain just gave it a 95 too. Guess it's GOTY. One of these games I guess that show how incredible the GamePad really is. Unique and lovely and fitting for 30th anniversary. Nintendo does what other never will. They did it again. Awesome. I wish I could go hibernate and wake up when the game is available. I went from wanting to give it a shot if was a cheap download, to not having any interest. I've played 20 years worth of 2D Mario, I don't think I need anymore. Definitive Wii U game, wow. That's bold! Awesome review! Now put me on a time machine and send me to the 11th, please! "but some neat shortcuts for copying and pasting, for example, utilise shoulder buttons." You say 'neat', I say 'lack of a multitouch compatible screen'. "So when we say that Mario platforming won't be the same again, we're not saying the time of normal 2D Mario releases is over." Except it should mean EXACTLY that. They can retire the New series, update Super Mario Maker as needed, and go on to create a new 2D Mario series that actually tries to surpass it's predecessors and/or mix things up. I'm seriously considering the special edition now. Baldurs Gate, your back on hold. Again. @Zelkardaim I love that gif!!! The wait is almost over for SMM. This game will remain relevant for ever. For ever!! 10/10 eh? I still can't say that I'm sold on it, though. I mean, it's awesome that we're finally getting a level editor for Mario, but it's still just a level editor. I see the value in it, but I don't think this is for me. After watching the plethora of streams in the last week, I've actually cancelled my pre-order. I'll pick it up cheap later on. I love Mario but not games built around user generated content. I don't think I'll miss it too much between Metal Gear Solid V, Fallout 4 and Xenoblade anyways. @NintyMan As if boss battles in NSMB games were that exciting in the first place..
Eh, not my kind of creativity, I want to see new ideas being put forth, not the same ones used in a bizarre way. It does look neat though. As for how this might affect 2D games going forward, they're definitely going to need to do something new to gain people's attention. 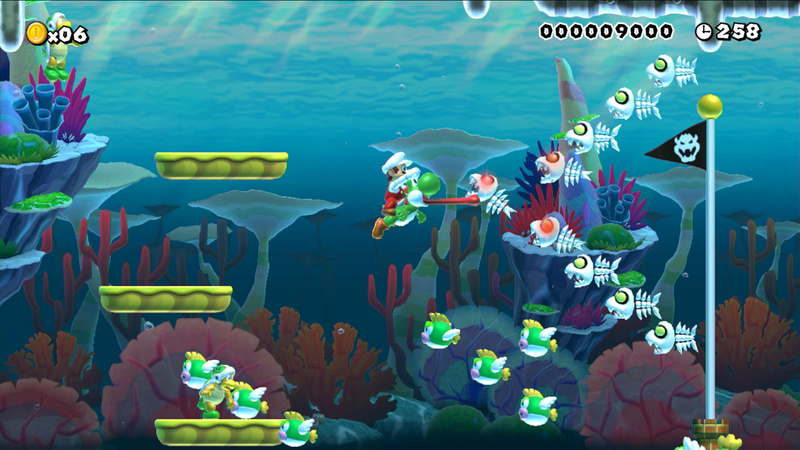 Beyond that though, I think perhaps they could fold this into a level generator mode for the next NSMB (albeit they may not be able to include everything this game has, maybe just the assets from the new game), it would be a good way to up the ante and make the NSMB series more replayable and less stale. Meh. I would have preferred Mario Galaxy 3 as the 30th Anniversary celebration. I have zero interest in creating stages myself, or playing frustratingly difficult stages that other people create. That does not sound fun. Already reserved. I know you guys don't hand out 10s often, but this is well deserved. It's too bad WiiU didn't launch with this game and Splatoon, it's fortunes would have been much different. @Smash_kirby They actually gave it a 9. I guess there's just the right amount of water, lol. "If 2D Mario games are the fine art galleries, Super Mario Maker is a public 'happening' of chaotic street art, in which anyone and everyone simply goes with their instincts with spray-paint in their hand. One doesn't supersede or replace the other, it merely enhances possibilities." See this is why I visit this site. That is an excellent way of putting it. "I do find it hard to believe that this is the "definitive" Wii U game." I believe they are referring to the fact that it is the "definitive Wii U game" because they see it as utilizing the gamepad/hardware so well. Smash and MK8 do basically nothing with the gamepad. Anyway, that's how I perceived that sentence. This'll be the first game I preload! @MoonKnight7 yeah pretty much. This should have launched day 1 along side ZombiU. I wish there were a half price version for people like me who just want to play, not create. I am so hyped for this! The 11th can't come soon enough! I will definitely get this but it is really hard not to see it as just a level creation tool even. I get you can play other people's levels and there are levels that come with it but the biggest draw comes from making the levels. What an unconvincing review. Sorry to be so negative: I can't wait for the game to land, but hyperbole city. "I'm surprised this got a 10 as I feel the lack of boss battles besides dunking Bowser in lava might deduct a point." ...they gotta save something for the inevitable sequel... Or perhaps DLC? Had my preorder for some time now and reading these reviews are just making me super excited about what I and others will create. I know there's people out there who don't see the need to award 2D platformers 10/10 in this day and age, especially Mario, as they don't feel the genre pulls its weight anymore compared to the possibilities of other genres and styles of games, but this game and it's execution are a demonstration of how to celebrate a 30 year classic such as Super Mario Bros. I don't see what more they could have done while keeping the core simplicity of Mario the highlight as it's seen here. @BinaryFragger Should it have been a launch title? Probably. But this game works so much better as an anniversary title. My only concern at the moment is that the fans-made levels will be trolling/difficult or just silly, destroying the memories I have about all my gaming life. I'm excited for the inevitable dlc (hopefully free) adding in more enemies, items and hopefully the koopalings. No miiverse stamps? Was hoping they would take off as an achievement system of sorts. Ah well. Day 1 for me! Does anyone know what the Smash Mario amiibo does when tapped? I can't wait. I do hope they keep it fresh with DLC adding new items and features. @gatorboi352 I'm 100% convinced if they released this game at launch, the gamepad supported multi-touch, and this game supported that feature you would still nitpick something. It's a great game that's coming out now, It can't utilize functions the WiiU doesn't have and it can't go back and time and be released an earlier. Can't wait, been wanting this for a long, LONG time. @Gen0neD I think Smash and Splatoon should be up there too. Splatoon is a brand new IP, obviously linked to the console. Smash- is sorta like MK8.... isn't this why we buy Nintendo? And- I'd also put Super Mario 3d World in there too. I didn't realize that NSMBU was going to be 2d- although I eventually enjoyed it, I was expecting more of a Super Mario 3d World type adventure. That said, I'm like you in that I initially wasn't looking forward to this, but the more I see, the more I want it. I'm definitely gonna get this, but I always saw this as much more of an in between game rather than a triple A game that many others, as well as Nintendo themselves, seem to be treating it as. Maybe that's just because of my lack of creativity though, so I'll be largely stuck with playing other people's creations. And in that aspect, I'm not particularly looking forward to the influx of super bad levels with tons of 1-ups, tons of randomly placed sound effects and no challenge, and the super hard Kaizo Mario levels, both of which I can see taking the upper hand way more than the more normal levels. If I had a say in the matter, I'd much, much rather have a full Super Mario adventure experience provided by Nintendo instead of this. That said, I'm sure I'll still get a fair amount of joy out of this, but definitely not the usual Super Mario triple A-joy, sadly. These are going to be long, long, loooooong days until I can get my hands on this baby. @gatorboi352 The review adresses this. Mark my words, this game will be a system seller. Obviously, Wii U will never, at this point, catch up to its competition, but Mario Maker will certainly move a lot of console sales. I have a few friends who wanted nothing to do with the Wii U this generation who have now decided to buy the system, if just for this game! @rockodoodle Agreed on the Smash and Splatoon. I was driving and I kinda glossed over those two for fear of rear ending someone. I also own those two games. Ironically. 10. And well deserved it seems. Mario platforming is one of the most entertaining genres of game ever conceived, and due to created content will still be worth every penny 20 years from now. What's more, Mario Maker ensures Nintendo's legacy lives on with gamers forever, no matter what happens in the future. I am so hyped beyond belief- this is what I've been waiting for, for a long, long time. It just took me a while to realize it. So many positive reviews are popping up. This game finally takes advantage of the gamepad, and the console bundle exclusive to Walmart in the U.S. may actually be a great idea. I kept reading that Splatoon was the defining game of the Wii U, but Mario maker looks like that game. Though ZombiU, and Deus Ex do get nods for great gamepad implementation. I seriously cannot wait for this,reading this review makes me feel like a little kid that just finished up school for the Xmas holidays who knows what's stashed away from him in the attic and eagerly anticipates the gaming heaven he'll be in on Xmas day.Between Splatoon,MK8 and soon this,I can honestly say i've never had this much fun gaming since the 90's. Not one for me, but I'm glad to see it will be a good one for those who pick it up. Shazam. My hype level has certainly increased. @Spoony_Tech While I agree with you, my kids have been Day 1 since the unviel. Don't your kids want this? I'm genuinely more excited to play this than any other game out there right now. I still say that if the Wii U had launched with a handful of games that truly show off the GamePad like Super Mario Maker does, and Art Academy: Atelier too, then the Wii U might not be flopping right about now. Bundling a couple of them with the Wii U at launch, and maybe even building stuff like this directly into the system's firmware, could have resulted in another generation winning console imo. I honestly can't believe Nintendo missed this trick with its own console and is only just now figuring out how to really show off the GamePad, when it's probably too late to really matter. @gatorboi352 #15 This is a question I have had myself, too, since this game's reveal. Where does SMB/2D mario go now, if anywhere, since you could(and they likely will) just add DLC to something like this? Can't wait for this (of course I will have to) Preordered the special edition on Amazon in UK a month ago. I like the idea of being able to switch between playing and creating (like LBP) that I think it will help drive that creative spark and just playing about with what you can do in a relaxed way will be a lot of fun. I thought for sure Best Buy would have a midnight release for this game, but I just asked and they aren't. 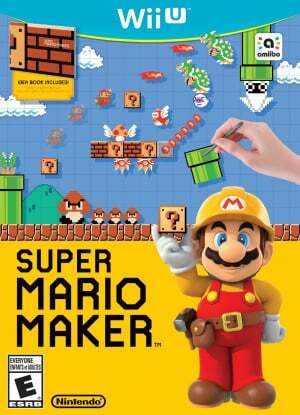 How are they not having one for Mario Maker?!? @Lalivero There's so much from those classic 2D Mario games that isn't in Super Mario Maker* that I don't think it will affect Nintendo making new Mario games, unless it's in a positive way (such as including a level editor in future 2D Mario titles), or prevent millions of people from buying them. *No real story elements, as simple as they are. No sloped surfaces. No scrolling the levels in different directions. No wrapped levels. No pipes with entrances and exits within the same area. No midway makers. No multi-player mode. No map screen(s). And so much more. @rjejr My son does but he doesn't know when it's coming out and I'm not telling him. If I can avoid it I'll get it for CHRISTmas! @Kirk So what do you suppose they'll add in the (most likely) inevitable future DLC for this game? Sounds like stuff they could use to keep it going for a good while. Not that they couldn't add a small touch/update and still sell a bazillion copies for a future release(looking at NSMB), but it was more a general question, as 2D Mario seems pretty...questionable at this point unless they do just that. Awesome score! Got the Classic Mario and Dr. Mario amiibo coming from Target, and will pick up my copy from GameStop! The Nintendo side of 9/11 will be awesome, the reality side.....eh, not so much. I have been looking forward to this game for some time. My daughter and I both loved Tipping Stars and we've been waiting to do even more. I wish there was a cool app for the 3ds that you could export levels to as well, but other than that from what I've read this is the full package. Looking forward to playing on September 11th. Would have been a great launch game for Wii U! I hope it's successful enough for them to do this for other games. I want a top-down Zelda maker! Wow, a review a week and a half ahead of availablity? Now you're just tauting us regular folk. To those raising the question of "last 2D Mario you'll ever need", well, no. It's a nice set of tools, but it's missing tons of things that have been staples of 2D Mario since at least SMB3. You won't even be able to slide down a hill of goombas due to the lack of slopes, and think of how many complex conveyor types and enemy types you'll have no access to. If you just wanted to use it to recreate past levels, you'd actually find very few you could do. This review pretty much nails that by calling it a divergent path. They're not giving you the means to create everything that could ever be in a Mario game, or even everything that ever was in one. Just a nice, big set of standard elements to mix and match, and a couple new tricks (has there ever been a level with those "one way" gates before?). 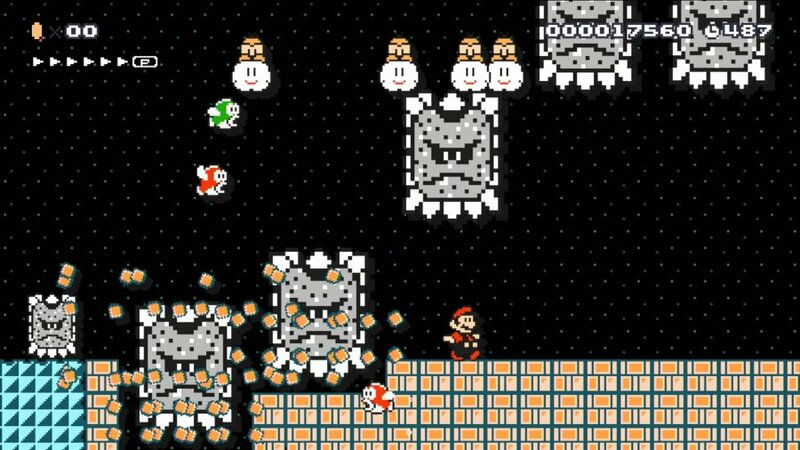 I trust the more inventive creators will come up with plenty of resourceful ideas, but you won't be able to put a Rex into your SMW levels, or set up a vertically scrolling "rising lava" level, or a Reznor wheel. The list goes on, but so does the list of possible new ideas. I just look forward right now to getting past this annoying period where the press keeps showing off what they're doing with it while we sit and wait out the release schedule. Woah... I seriously wasn't expecting this. Looks like this game is gonna be right up there with Ocarina of Time. The download version is sitting RIGHT THERE on my Wii U and I CAN'T PLAY IT!!! From everything I've seen of the game, it deserves a 10/10. I would be amazed if they could make a fighting Stage for Super Smash Bros, based on Mario Maker, where the stage begins to create it self with the fighters, and the stage is different every time. Wow, a 10? Sounds pretty [email protected] to me! Definitely grabbing this. @Lalivero Probably not as much as people think, if they even do have DLC for it. At the very least I'd like to see midpoint saves/markers. Also, regarding the future of the 2D [playing] Mario platform games—imagine if they go for a full 3D polygon art style, similar to Super Mario 3D World, but stick to the classic and beloved full 2D gameplay and camera. 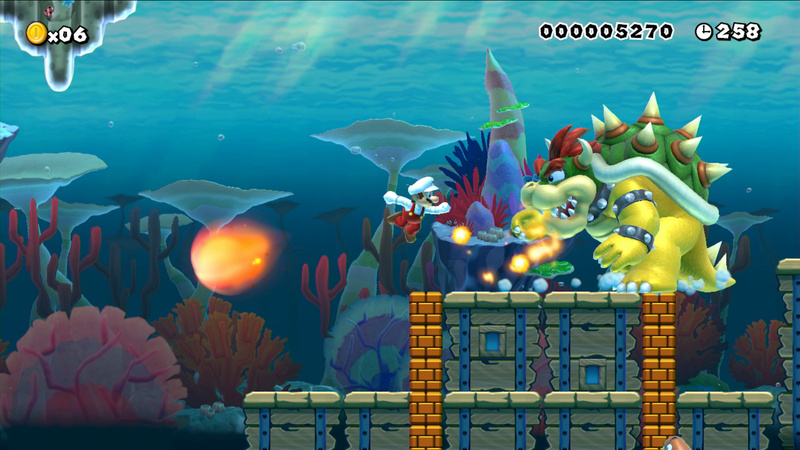 That alone would would at least look very different to any of the game styles seen in Super Mario Maker. To be clear, I'm not talking about what we've seen in the "New" Super Mario games, as that's not quite the same thing, and still has a very flat look to it. Something like Kirby's Triple Deluxe is more the kind of look I'd like to see in a new "2D" Mario platformer. Beyond that, there's all the other stuff I mentioned, and just a whole lot more they could to do to still keep these full-fledged 2D games relevant and indeed special. Good thing about the hand options, the main one was creepy as hell. Lots of negativity in the comments section. This is what Mario fans who grew up on these 2D games have been waiting decades for. I guess if your first game was Mario Sunshine it could seem pretty "meh", but don't poo poo something that a lot of other people REALLY want just because it isn't to your taste. The argument of 'it has more levels' is invalid because these are levels made withing the tool, albeit shortly, and you only have the same themes, while in a proper mario game, you had more polished levels, with different themes. @Aryx Have you seen any of the levels that people are creating with this? That's what the hype is about. I really don't get why you're not hyped about this game. I mean like, it feels like for month's all Nintendo talks about is Super Mario Maker. Like it's the only game that matters. Or perhaps it's the overall lack of retail games coming out for Wii U that contributes to the over-hyped attitude towards this game ("THANK GOD, FINALLY SOMETHING GETS RELEASED"). I could understand that, though. @Misterman I have, I'm just not the builder/creative type so it's not really my thing. For the people who are, I imagine, this must be great. I would be more interested in learning more about XCX, Pokken Tournament (and even Mario Tennis). Instead we are repeatedly spammed with every tinny little detail surrounding Super Mario Maker. Blergh. I just knew this would get a 10/10. After E3 I really got interested I this game. I need it to be release day...like now. my fingers are getting antsy. Awesome, figured this was going to be great. Now back to MGSV. @Spoony_Tech Good plan. My kids know when everything is coming out, it's my justification for being on NL 13 hours a day. Christmas will likely be 1 or 2 Skylanders games, XCX Collectors Ed. for me, maybe Lego Dimensions too. Lots of Skyladers characters. Possibly Yoshi Wooly's World for the family, and some Yoshi amiibo stocking stuffers. So SMM is for my son't birthday Sept 17, but he may get it day 1 due to 4 day weekend 12-15. If you ever wonder why I'm so hard on Nintendo for release dates, it's b/c I'm planning for 3. @Aryx You want more coverage for Mario Tennis? Here you go: you hit the ball back and forth. @Misterman Yes, lol. Seriously though, more diversity in coverage is what I want. I wouldn't expect any less from this game. It's going to be truly fun becoming a creator or just playing other people's exciting levels. Can't wait for the 12th! Didn't expect a 10, but looks fun indeed. It's the best highlight of Nintendo poor E3 performance after all. I MUST disagree, sure the game offers alot of different content but in the end it's just so limited. And don't get me started on the limit of only 2 ''bosses'', of course you can get creative with them but it just doesn't do it for me. I always wish there would be a taaad bit more enemies, the current amound is just not much, it's not even half of what SMW has to offer? In conclusion I don't think it's the ''definitive'' Mario experience, it looks fun, but VERY limited..
Wow, nice. Still doesn't interest me but I hope everyone else enjoys it. Game of the year, calling it right now. I mean, all the negatives I've seen people have been pointing out are just minor things that can be solved with a simple update. And I'm sure DLC will be a thing, adding new awesome stuff. Can't wait for this damn game, hype level is over 9000. L/R rotates the pieces as you attempt to place them, so you have to hold the GamePad in a different manner while performing these actions, whereas a simple tap of a second finger would have made matters much easier/delightful. Not a day 1 buy for me, but I'll definitely pick it up at some point. I'm surprised that this got a 10/10 yet at the same time I don't know what I expected, this site is biased (not always bad thing really, after all this is a Nintendo site) Based on the scoring policy, it seems a 9/10 would be more fitting because I can't imagine someone who doesn't like platformers enjoying this. Still, good review and I'm excited to play this when it arrives. Also, is this the first Wii U game to get a perfect score here on NL? I can't remember anything else getting the score but I'm probably wrong. Question. Does completing the 100 Mario Challenge unlock all Amiibo costumes, and can you choose the ones you want? Also, can you string together different levels to make worlds? I'm so looking forward to this, glad it's reviewing well . Super Mario Bros. was the first game that I owned and the first game I completed; can't believe it's been 30 years already. @nick3529 Just curious, how much have you spent with the game? It's surprising that this got a 10 as I was expecting a 9. I'm still super hyped for this and have preordered it, but extra bosses would have been nice, and the 1 day wait for new content instead of it being based on play time is annoying. Still hate Nintendo's "training wheels mentality" with the whole 9-day content embargo on this $60.00 game. Can I pay for this game in 9 installments, then? Also, nice release date, Nintendo. But I have watched alot of streams about, all of the gameplay! Luke warm response from critics, probably sell to owners already. All the stages just looks like a cluttered mess. I hope this isn't the end of the regular 2D Mario games. @MyBodyIsReggie sigh Japanese company. Even if they weren't Japanese they were trying to pick a date near the actual anniversary but still be on a day that they release games. They don't release stuff on Sunday which is when the 13th is. If you are offended by a video game releasing on 9/11 how do you feel about the rest of the day, when people go to work and life moves on as usual. Disclaimer: I'm an American and I lost family on 9/11... still buying this day one. I would hope you'd be playing the game for longer than 9 days; I for sure will be playing it for a long time. Yes it's a pain, but 9 days later you've got everything, and the more days you spend with this game, the smaller the fraction of time is where you didn't have everything. @TheWPCTraveler I don't think it's indicative of anything. People dig creation games. There's a reason why the likes of Minecraft is so popular. Wow, the definitive Wii U game. Nice! Can't wait to pick it up on launch day. Of course, this was my most anticipated game of the year even before the review. Still not completely convinced I will buy this as I don't think I will have the time to create levels, but after watching a few vids on youtube of people playing levels and having an absolute whale of a time (whilst sitting there laughing and wincing and feeling every mishap), I am sorely tempted. It's a level of challenge and fun I haven't seen since Super Mario World - one of my all time top games. @AyeHaley Well the final boss battles are interesting, other than that though, yeah I agree. Looks like I finally have a good reason to get a Wii U. @Volcanox It has an average of 89% on Metacritic after 36 reviews with all but one of them positive.25 of those 36 reviews have rated it 90 or above including many of the bigger sites.How in any way is this a "Luke warm response from critics" ? "On a side note, I've never seen so many people excited about 9/11....."
That was a weird thing to say. I thought it might be 10/10, when a console defining game comes along I have no choice but to get it. @OorWullie It's not quite hitting that AAA 90-95 and up level. Its a bit disappointing. Thomas Whitehead... I tip my hat off to you. That was by far the BEST NintendoLife review I have ever seen! Super Mario Maker truly deserves a perfect 10 score. Two days after my birthday, I'm gonna buy it on Patriot's Day! @KingofSaiyans I agree, it's rather disappointing. From September 11th to the 13th, I and like 20-odd other friends are staying at the same house playing games. Mostly Smash since that's what we're about, but I'm sure we'll also find the time for plenty of Mario Maker goodness. It's probably as good an environment as it gets to try out the game for the first time, beating crazy levels with so many pals and having some great laughs along the way. @FLUX_CAPACITOR Lol! Are people on here SERIOUSLY thinking that Nintendo picked this date to Piss off loads of bereaved people from the tragedy that happened 14 years ago? Only America. The world still turns guys. Europe gets it first. What a surprise. I bet nobody saw that one coming. I've never been that huge on level editing, but the nostalgiac appeal tied to SMB 1,3 & World and being able to invent your own stages and more importantly at least in my case getting to play levels that other Wii U owners have created is incredibly appealing. Buying. total no brainer! @MoonKnight7 Well, it is true. Considering this is a Nintendo fan site, I'm not surprised it received a perfect ten, since it is a bit biased. Although in all fairness, the game so far appears to average at a solid 9. So you are around the current average, and in all honesty, I have no doubt in the game's overall quality. @FLUX_CAPACITOR oh totally yeah! No one will ever forget that horrible day. I was 20, working in a phone shop, watching it on a small tv here in Dublin. Jesus it was terrible! But as a friend said to me about the release date last week 'they are trying to make it a happy day, fair play to Ninty' and I agreed. Just, ya know, it was horrible, people here in Ireland lost friends there too that day, but you know, people (the world) move on, just like me when my mam died 13 years ago to poxy cancer on new years day, you have to move on. People who bring up the date for this game now, are just looking to be offended. @XCWarrior My thoughts exactly! We need more games like Splatoon. @FLUX_CAPACITOR anyway Mario maker yay! Can't wait for the 11th now. Awesome sauce an all! I expected nothing less for Super Mario Maker. However, calling this the definitive Wii U game is a bit of a stretch. Sure, it utilizes a lot of the Wii Us capabilities, but there's always something more Nintendo can do with it. @FLUX_CAPACITOR don't worry, they will have cod maker or fallout maker or Arkham maker or even gta maker in 10 years time when they are all retro lol. Guess they are all called mods now. @readyletsgo anyway I better get to sleep, it's like crazy o'clock and I have the day off tomorrow to play psp games and pack for the final festival in Ireland at the weekend. I'll totally ignore packing lol. By the time it drops in price (i'd guess around 2018 - 2020) there will probably be thousands of created levels available. It's a game that will just get better with age. Definitely not going to buy this after Nintendo sent out review copies to YouTube personalities just to bait them all into doing reviews (which, I will remind you, are legally protected by Fair Use and are not a gray area like Let's Play) so they could Content ID/Copyright Strike all the videos. Screw off Nintendo, you guys are the worst. Worse than Konami, worse than Ubisoft, worse than EA. I don't even know why I still own a Wii U. @FLUX_CAPACITOR #161 I think you really hit it on the nose with that statement, and it was very nicely put. Awesome review. I honestly can't wait to play this game, I'll be having tons of fun creating levels which I always wanted to do since I played SMW. Holy Moley a 10. I am wanting this game now even more. this game was a creep up kind of hype because now I want it. I hope it sells well. You go Ninety. @CaPPa Will the online servers still be up in 2020? Ever since the first level editor for Super Mario Bros by YY came out (allowing anyone to make their own ROM hacks), I swore Nintendo had to release a Mario game that let you create your own levels. Every kid in the 80s doodled in notebooks dreaming up their own levels. Now those levels can become reality! Surprised at all the negative comments here. "Just more 2D Mario..." well, you can think that if you want, but this sounds like an amazing game to me. "The levels will mostly be crap and clones" Yeah, of course lots will. But there'll be tens of thousands of levels, and the hundreds of great levels will rise above the rest and give players amazing experiences. Not to mention that it sounds like a lot of fun just to make my own levels. I think this will get many many hours from me for a long time. I just wish I wasn't starting university right when this is coming out! Not sure if I should get it right away, it might be too tempting with all the work I'll have. Where were you all summer?! Gotta hand it to Nintendo this time!! 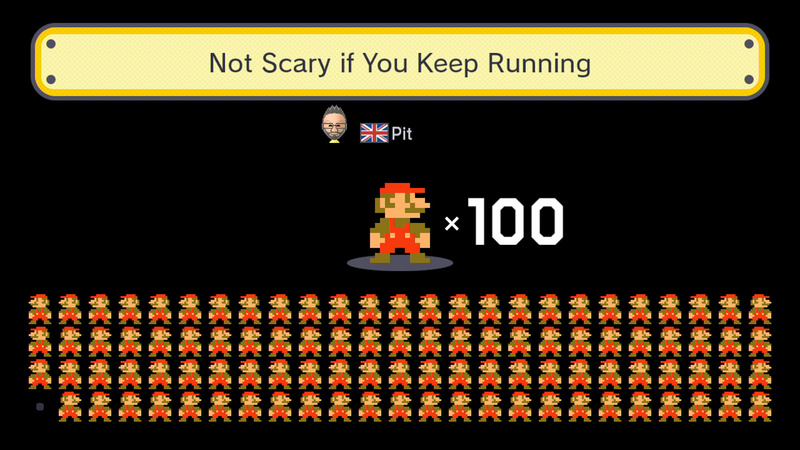 Mario Maker taps into all the things people like about Nintendo. What a fitting celebration for the 30th anniversary. This game also captures Iwata's game philosophies perfectly - games should be fun to play; games should appeal to a wide audience and bring people together, games should create new experiences, games should be intuitive, games should put a smile on people's faces. This is the FIRST game that made any of my friends enthusiastically call me from accross the country just to tell me to buy a particular game and that he can't wait to make, share, and play each others levels and also play with his kids. I told him I was going to call him to tell him the same thing. Well done. Perfect 10 is fitting. I've pre-ordered this; I should be sent a t-shirt from Nintendo store and badge set from another on-line retailer. Dunno what I'm looking forward to the most? Wearing the t shirt or admiring the badge set in a nice decorative box, I'm going to be sad I'll wear the yellow the t shirt whilst I play it. I am also going to try every possible level and of course try to design a few of my own levels, I've also set myself a challenge I'm going to see if I can do a re-run of Super Mario World and find all 96 exits before this game hits my letter box next week. I'm excited and have set a countdown timer, 'I will give it a look now' 8 Days, 14 hours, 29 minutes! (I don't know how accurate it is) to go!! I just wish I've booked some time off work for it but I don’t know how speedy it will be once posted, I also wonder how many consoles Nintendo will sell as a result of this game being released? Also I will check Nintendo Life like I do every day, to find out what else the big N has in store to celebrate Mario’s birthday. "Definitely not going to buy this after Nintendo sent out review copies to YouTube personalities just to bait them all into doing reviews (which, I will remind you, are legally protected by Fair Use and are not a gray area like Let's Play) so they could Content ID/Copyright Strike all the videos." Isn't it standard for companies to send review copies to reviewers who requested a copy under their permission? Also, I haven't seen video reviews get flagged. Only raw game footage with no commentary over it or editing. "Screw off Nintendo, you guys are the worst. Worse than Konami, worse than Ubisoft, worse than EA. I don't even know why I still own a Wii U." No, they aren't. Konami treats their customers, employees and franchises like poopitypoop and takes reviewers to review camps to make reviewers give a rigged review, Ubisoft releases broken games and halts releases for insulting reasons, EA release broken games and the ones that aren't broken have micro-transactions, EA also forces their subsidiaries into shutting down after screwing up releases and has poopitypoopy marketing. Also, give your Wii U to someone who wants it if you seriously don't want it. 10/10 is unexpected. The editor is far too limited to warrant that score. I mean it doesn't even have the ability to create slopes at all. A good portion of Super Mario World levels can't be remade in it due to this. It also doesn't let you create any sort of triggers (other than P switches that only have one set function), so you can't even do a proper boss. I understand praise for it as level creation is fast and simple and sharing is pretty easy, but you aren't going to be able to make anything too complex or really interesting. There's fan-made Mario editors that are far better (yet more difficult to use). Compared to similar titles like LittleBigPlanet and WarioWare D.I.Y., options are extremely limited and price seems high for what you get. Guess there's hope for patches, though I don't expect anything major. @multicoloredyoshi Following your logic, since Super Mario World can't have flying goombas or canons shooting coins in water, Super Mario World is far too limited? Super excited for this one. I love level editors (it's all I did in Tipping Stars) and every video I see for it just gets me more and more pumped. Me: Oh, you'd love Super Mario Maker! Me: This new game from Nintendo where you can make your own Mario levels. Them: Oh, that sounds really cool! They had never even heard of it! @jariw I don't think whatever analogy you're attempting to make works. Your example doesn't correspond with anything I said. I'm just stating that the editor is limited in comparison to similar editors. The only Mario game you could completely recreate in it is the first one. That's a clear statement of how limited it is. Super Mario World is not an editor of any sorts, nor was it ever intended to be. Stating it's limited because it didn't have certain features present that weren't even conceived of yet would be illogical. Super Mario World was of course innovative and different for it's time. Looking at it from a current perspective, pretty much any SNES game could be considered limited in comparison to today's gaming standards. Man...I can't wait. Seriously, this is gonna be awesome. I'll probably make terrible levels, but luckily you guys are gonna make great ones to keep me occupied for years. @multicoloredyoshi The toolset is not a "statement on how limited it is", since the purpose of Super Mario Maker isn't to recreate games that are already available. 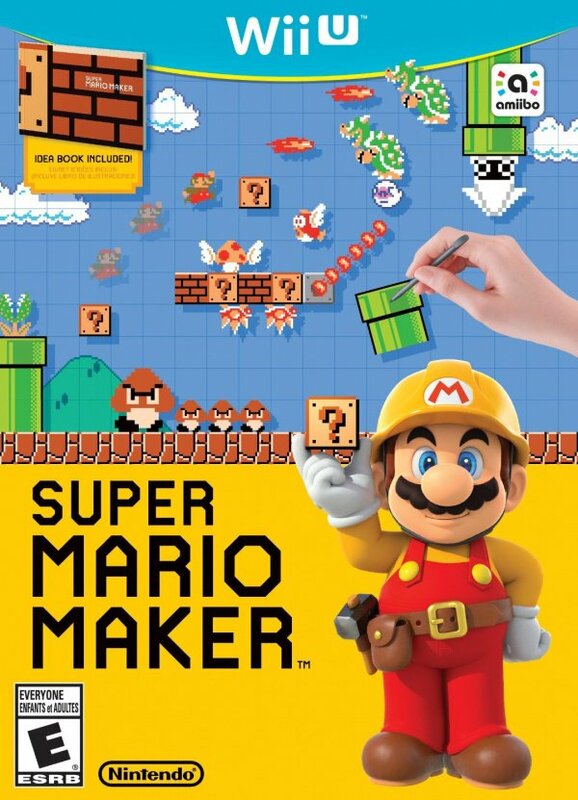 Super Mario Maker can combine gameplay elements in ways that no Super Mario game currently available has done. You're comparing apples and tomatoes. Great review guys, it really does sound like they've streamlined the level-creation genre. I was never really interested in making my own levels in other games, here it seems I may create a few before even playing the challenge levels. Having said that, I bought my Wii U just for this game. So yeah, system seller IMHO. I personally might hold off on getting this until I see what their future schemes with it turn out to be. 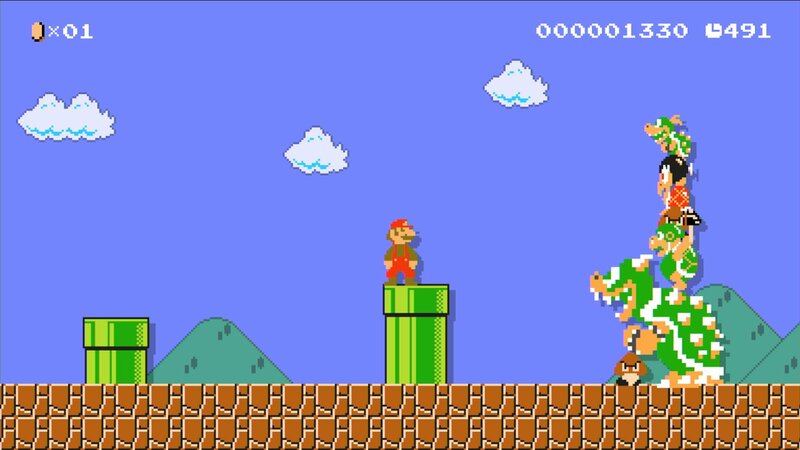 I have a question: With the 10 Mario Challenge mode, is it just levels that come on the disk, or is there an option to have it pick levels other players have created? I just hope GAME go through with my pre-order bonus! Quite frankly, it wasn't necessary and awkward to read; we all know. I'm just calling like I see it. 10! Who saw that coming? @jariw While it is true it is not the purpose of the game to recreate older games, the toolset still greatly restricts you despite the additions that you've mentioned. I am pointing out problems that people ran into when creating levels, in other words restrictions of the editor. The only games I compared it to are LittleBigPlanet and WarioWare D.I.Y. which are in the same genre. It's not a case of apple and oranges. You fail to take into the aspect that this game is also a game editor, and I am merely pointing out that there are a lot of level ideas that people would normally want to make in this game and it's not possible. It just bothered me that the review didn't mention any of this, as just looking at YouTube videos of others who had review copies you can see these issues mentioned multiple times. The new guy at playtonic made a brilliant thwomp level. Brilliant. Like I realized later I was smiling through the whole thing. A lot of folks are not enthused by this. I just don't see how you can stare in the face of endless, eternal Mario levels, perpetual new platforming ideas, and the unleashed creativity of the masses in four versions of the Mushroom Kingdom and shrug "meh." This game is an automatic buy for me, so I'm just going to throw out a couple of things: 1) release a version of the editor for tablets; 2) start working on a 3D Mario platforming level editor. I almost wanna buy another Wii U just to have this game, can't do it though. PS4's where its at for me these days, but this game does look awesome. @MoonKnight7 Yeah, uh, how was it awkward? I was just observing how people are excited about a date that usually comes with gloom and doom. It is a very weird date to release the game on, considering what happened in this country on that date. With that said, it's also my mother's birthday, so I don't really associate it with disaster on a personal level. September 11 is a date on a calendar that happens to be a Friday this year. Just because this particular tragedy is identified by its date doesn't mean the global economy should cease. We don't avoid releasing games on Pearl Harbor Day, or the date of the Oklahoma City bombings, or the date of the Newtown massacre, or the date of the British bus bombings, or any number in the litany of national tragedies that have occurred in the last 100 years. Bad things have happened on many days; 9/11 just happens to be the one we identify with a date rather than a description, so it stands out to us. 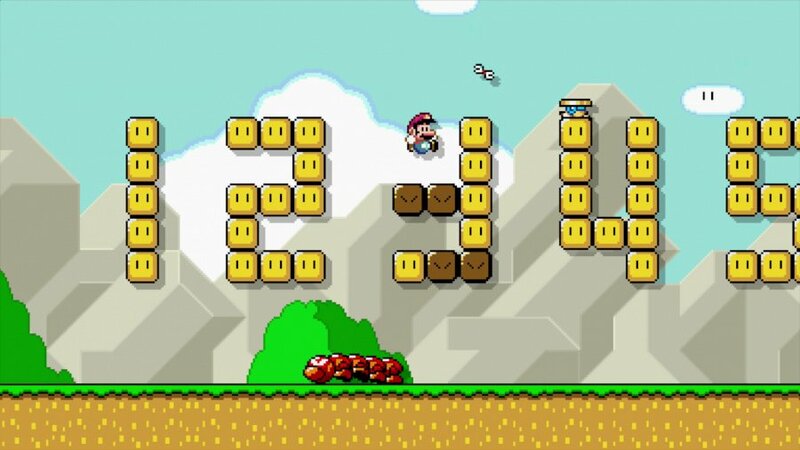 Let us have no more discussion of this silly date issue, because Super Mario Maker looks awesome. I need it. I NEED IT. I might start having a panic attack if I don't have it RIGHT NOW. @TheLobster Hey, at least "they"'re aware of it now! "I was just observing how people are excited about a date that usually comes with gloom and doom." I know what you were getting at, but like I said, it was simply unnecessary to bring up, so yes, I interpreted that as awkwardly stated. Particularly your phrasing at the end. It certainly made me feel weird, reading it. It was just strange that you said it, and like that, in the first place, that's all. I'm not looking for an argument, I'm just calling it how I see it, and there's no need to discuss this further. I assume you are talking about our conversation above? I have no problem whatsoever with people simply moving on. Nintendo even addressed the date at one point, which was respectable. The above sentence was just weird, that's all. @MoonKnight7 I'm not sure what was "unnecessary" about it. Most people know about this particular date, and it holds a lot of meaning to them. It feels weird to me that some people don't acknowledge it and act like it's just another date when a video game is getting released. @MetaSmasher it's ok you don't do any work in your first year anyway! @multicoloredyoshi that's surprising and a bit disappointing there's no ability to put slopes in it, although surely that will be patched in. @Deanster101 Yeah I hope that Nintendo plans on adding stuff to the editor, but it's hard to know what their plans are in regards to DLC or updates as they haven't mentioned anything yet. The game isn't even out though, so that's expected. @MoonKnight7 Pikmin 3 would be the definitive WiiU game then. Yeah, I don't understand the whole 9/11 thing. Games have been coming out on that date ever since it happened but why are people only now bringing it up for SMM? @mjc0961 Wow. Your comment was so ludicrous I had to take a look at your profile and see your recent comments. I scrolled for a while and you haven't said a single positive thing. Like, ever. @gatorboi352 Was it even in production when the Wii U launched? Nintendo just wasn't ready to launch a new system.Could the Wii have lasted another year for Nintendo to make more games? @Gridatttack It includes an art booklet in every copy? So excited to buy this! Preordered and payed for, now I just have to wait one week! Nice to see it's geting high scores! ...did NOA say why we get a red box? and why the modern amiibo is only in the bundle? can't wait to play this! just pre ordered mine! Too close to my dreams. Some things you should keep out of reach. 10/10 aside, this is probably the best NL review I've seen in a while. I'm starting to get tired of "original" stupid levels server is full of. Here is 30 minutes of unboxing this GREAT game. The artbook is amazing! I mean, Super Mario Maker looks great, I've played it and it's by far the most intuitive level designer to date....... but saying Super Mario Galaxy 2 was AVERAGE Nintendo? That was my favourite game of all time. I've played Super Mario Maker at a friend's house, and it truly is great fun. But does it make SMG 2 look average? This game is just awesome! I Just bought Wii U with (and because) this game and I am hooked ;D. I have't played console games for a long time, but know it is very hard to put the controller down. Highly recommend this to every Mario lover, this is like a dream come true. Damn you Nintendo, how I suppose to get back to my work after holidays? And I want a desert and snow level!